Your recent member article regarding Civil Air Patrol, Discrimination and the American Disabilities Act brings another shameful story forward. Major Michael W. Bell, CAP (Captain U.S. Army Reserve), a war veteran suffered discrimination in both Race and Disability while in Georgia Wing. To make matters worse, he was also hit with a reprisal termination hearing to ensure that newly appointed Georgia Wing Commander Col Richard Greenwood would not suffer an IG complaint during his first year in the duty position. Major Mike Bell served his country honorably in Iraq with the U.S. Army and was a civilian aviation Instructor. In early 2013, Maj Bell requested guidance from multiple CAP commanders and advisers seeking to address Equal Opportunity and Disability Discrimination in Georgia Wing. By May, he came to the conclusion that he would need to file a formal complaint against Georgia Wing officers Lt Col John Aden and Lt Col Charles Talley and possibly even Col Richard Greenwood. Evidence of this is recorded in Bell’s own letter provided in the second attachment. In response, Wing and Regional CAP officers maneuvered to block Maj Bell’s complaint with a preemptive counter complaint coaxed from a cadet who attended a June 2013 Region Cadet Leadership School in Knoxville with Maj Bell. Although evidence was insufficient and the cadet was reticent, the complaint was encouraged and facilitated by Lt Col Dent Young, a Tennessee Wing IG who, unofficially and without duty position assignment, served Col Al Bedgood in Southeast Region Command. Dent Young was found to be personal friend of the Knight family in Georgia who had improperly leaked information to Lt Col Joe Knight III during a 2012-2013 investigation that led to Joe Knight’s suspension from Civil Air Patrol for his role in threatening an FAA Flight Instructor. 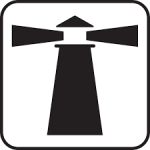 See Figure #2. The termination process against Bell was initiated by none-other than Col Richard Greenwood, Georgia Wing Commander. Suspecting foul-play, Maj Bell requested that the termination hearing be taken completely out of Southeast Region influence. A hearing for Maj Bell was not scheduled until a FULL YEAR LATER in June of 2014 to take place on July 11th. This violated CAP regulations and showed the deliberate effort to ensure Col Greenwood would complete his probationary year without incident. CAP Legal Officer Lt Col Richard Sharkey presided over the hearing with instructions to pass his ruling to then Great Lakes Region Commander, Col Robert M. Karton. Maj Christopher Golden represented Col Greenwood in “prosecuting” the termination charges against Maj Bell. See Figure #3, in which Maj Bell himself released the information regarding his hearing. Well, Gentlemen, seems like we have a date finally. In further violation of CAP regulations, the hearing committee’s findings on the counter-complaint were left unaddressed for more than EIGHT MONTHS. During this period, Maj Bell made multiple attempts to inquire of the outcome with Col Karton, but his communications were ignored. See Figure #4. This is Maj Michael Bell from GAWG. A board was held concerning my appeal of termination from Civil Air Patrol on June 11, 2014 by members from the GLR [Great Lakes Region]. I am concerned because it has been 90 days and I have not heard anything from anyone. CAPR 35-3 says usually after 3 days of the board the Approving authority makes his/her decision. I would like to know if I have missed anything. Thank you for your time on this matter sir. 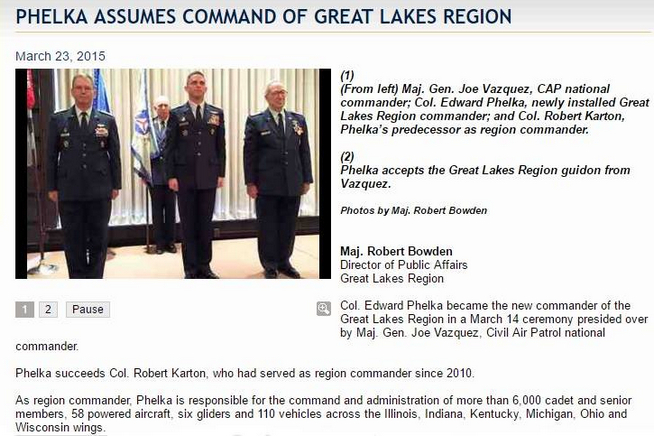 Maj Mike Bell was not reinstated until just before Col Karton turned over command of Great Lakes Region to Col Edward Phelka. See Figure #5. Maj Bell was quietly reinstated in March of 2015, but without any of the necessary paperwork stating the findings of the hearing or the required written decision of Col Robert M. Karton. He simply re-appeared on his squadron’s roster at Fulton County Composite Squadron. Those familiar with Georgia Wing and prior accusations against Col Greenwood, understand this dynamic completely. 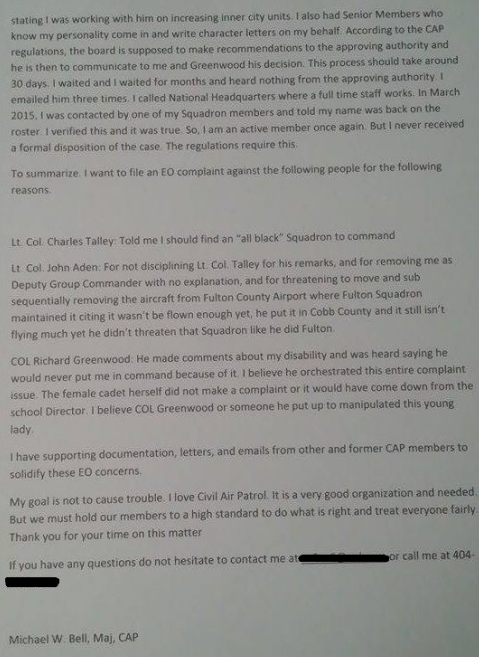 Maj Bell recorded the lack of appropriate paperwork and immediately resumed his attempt to expose and correct the problems with racism and disability discrimination among Georgia Wing pilots and commanders. He had collected many evidence items from people in different units in Georgia Wing. On May 25th 2015, he circulated an email and a letter that he sent to multiple people, including the CAP/EO, the U.S. Air Force IG and to Congress. “This process should take around 30 days. I waited and I waited for months and heard nothing from the approving authority. I emailed him three times. I called National Headquarters where a full time staff works. In March 2015, I was contacted by one of my Squadron members and told my name was back on the roster. I verified this and it was true. So, I am an active member once again. But I never received a formal disposition of the case. The regulations require this. To summarize. I want to file an Equal Opportunity complaint against the following people for the following reasons. Lt Col Charles Talley: Told me I should find an “all black” Squadron to command. Lt Col John Aden: For not disciplining Lt Col Talley for his remarks, and for removing me as Deputy Group Commander with no explanation and for threatening to move and sub sequentially removing the aircraft from Fulton County Airport where Fulton Squadron maintained it citing it wasn’t be flown enough yet, he put it in Cobb County and it still isn’t flying much yet he didn’t threaten that Squadron like he did Fulton. On July 10th 2015, Major Michael W. Bell passed away. 6 Comments on "Discrimination Complaint Reprisal in Georgia Wing"
Articles posted here have been helpful. There has been a growing swell of hate groups in Georgia and other states and we have seen evidence of Civil Air Patrol closing and opening units to take advantage of this dynamic for fun and profit. Check out The Dustin Inman Society (Marietta), American Vision (Powder Springs), Aryan Nations Worldwide (Villa Rica), Keystone Knights of the KKK (Cedartown), United Northern and Southern Knights of the KKK (Ellijay), Washington Summit Publishers (Augusta). Local Civil Air Patrol leaders are working outreach into the most racist areas of the country, while CAP National Headquarters appoints tokens and writes policies that they don’t actually enforce. When I was a cadet, years ago, I saw that one the more rural squadrons in my wing had a KKK influence and there was a gun locker that was hidden away whenever they received outsiders. I reported what I saw to my chain of command, but all I got was the silent treatment. If the Air Force would railroad a sacrificial lamb like Major Clarence Anderson III, would you really expect that Army Capt Michael Bell would have been able to hold the Georgia Wing people accountable? You are correct. The problem is that each Inspector General is merely the “eyes and ears of their Commander”. What this means is that an IG can be bribed, intimidated, obstructed, delayed and even counter-investigated to change or discredit the results of vital findings. Merle Starr was replaced by Ken Parris as CAP National IG so that the misappropriation of donated artifacts would not come to public view during Charles L. Carr Junior’s term. The Dayton Daily News was quick to expose THAT nasty coverup. Much worse, most of the appointed IGs and Inspectors lack the required life skills and even required CAP short course training. Compliance Inspection findings across all the CAP Wings have revealed this fact. IGs serve as front-end risk takers for their more promotable commanders who are corrupt but-not-yet-caught and looking to bury complaints against them on matters of taxpayer fraud, aircraft safety and sexual abuse. This illustrates the bleak landscape faced by whistle blowers and IG investigators. The numerous allegations of reprisal and misconduct directed against senior CAP IG officials and commanders call into question the efficacy of the whistle blower policy. One can make the case that the CAP Inspector General has failed. This is a pathetic, anemic excuse for an investigation. What happened to Maj. Bell already has a chilling effect on whistle blowers relying on official channels. This is just more evidence that the system is corrupted. The all volunteer CAP, in some respects, is like an out of control frieght train. For far too long, the USAF has placed it on a pedestal. Stories like this and others demonstrate that far too many volunteers shouldn’t be in the organization in the first place. Sad for all the families.